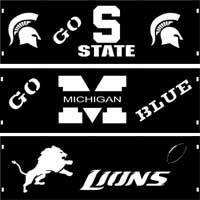 These Fans of Michigan Fire Pit Rings are available for Michigan State, U of M, and Detroit Lions fans! The 14 gauge steel Michigan Fire Pit Rings make a great center piece for any fire pit area and a good conversational piece while sitting around a bonfire. 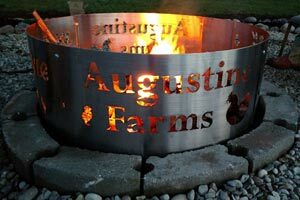 The plasma-cut silhouettes for the Fans of Michigan Fire Pit Ring provide a beautiful glow and ambiance with the cut-outs glowing red in the evening sky and reflecting on the ground. The cut-outs also create a nice air vent for the fire to burn hot and radiate a lot of warmth. The fire pit rings are designed to sit right on the ground (there is no bottom) and is perfect for campfires. The sides are 12 inches in height, 36″ in diameter and feature plasma-cut silhouettes of Michigan State, Michigan, or Lions. Use it at the campsite, on the beach, or at your summer cabin. There is nothing better than relaxing with family and friends around a warm fire. The easy to assemble system allows for convenient handling and moving to your next destination. Painted black with high heat resistant paint. Do not leave fire unattended. The Custom Fire Pit Rings are available in 4 sizes. NOTE: A mock up will be emailed for your approval prior to creation. NOTE: Complex or intricate designs may incur an additional design fee. 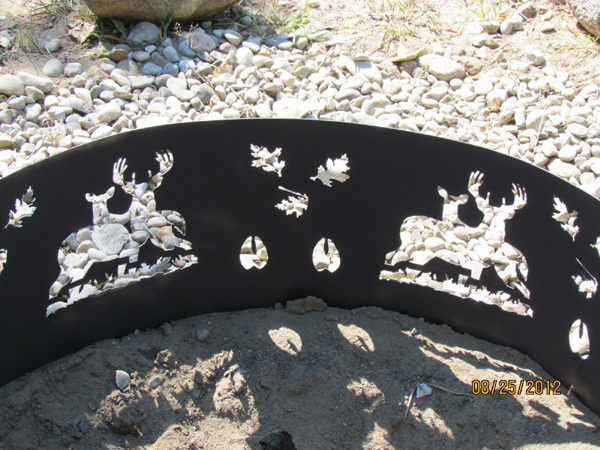 Deer, Bear, Elk, Moose, Michigan Map designs are available in Standard Fire Pit Ring with option of name. Each 14 gauge steel Custom Fire Pit Ring is a decorative center piece for any fire pit area and makes a great conversational piece while sitting around a bonfire. The plasma-cut wildlife silhouettes provide a beautiful glow and ambiance with the cut-outs glowing red in the evening sky and reflecting on the ground. The cut-outs also create a nice air vent for the fire to burn hot and radiate a lot of warmth. The fire pit rings are designed to sit right on the ground (there is no bottom) and is perfect for campfires. 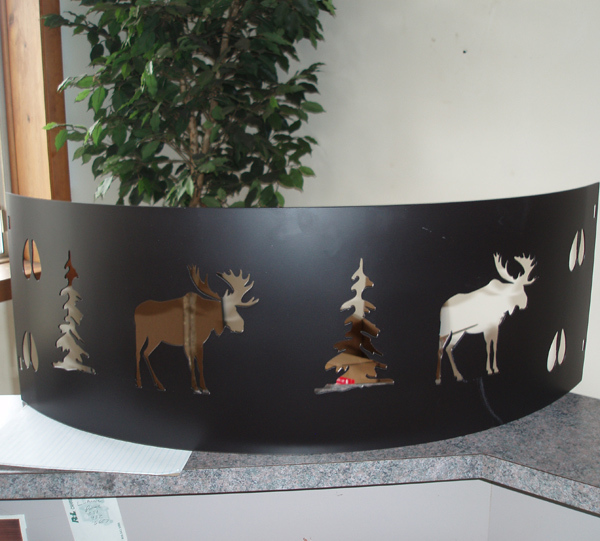 The sides are 12 inches in height, and feature plasma-cut silhouettes. Use it at the camp site, on the beach, or at your summer cabin. There is nothing better than relaxing with family and friends around a warm fire. The easy to assemble system allows for convenient handling and moving to your next destination. Painted black with high heat resistant paint. Do not leave fire unattended. Allow minimum of 3 weeks for customized fire pit ring. These 14 gauge steel Fire Pit Rings are a great center piece for any fire pit area and make a good conversational piece while sitting around a bonfire. The plasma-cut wildlife silhouettes provide a beautiful glow and ambiance with the cut-outs glowing red in the evening sky and reflecting on the ground. The cut-outs also create a nice air vent for the fire to burn hot and radiate a lot of warmth. Standard Fire Pit Rings are available in 5 sizes in your choice of Deer, Bear, Elk, Moose, Michigan and with optional name.